Did you know that most job openings are not advertised? It's true — most employers have enough applicants without advertising. They often prefer to find employees from people who they trust. This network of referrals is the "hidden job market." You can tap into this network by getting to know people who can help you. Don’t ask them for a job. Ask them for information. Use the Networking Memory Jogger (pdf) to organize everyone that is in your network. You can ask about the occupation. You can also ask about industries or employers. You ask about what you want to know. Be polite. Don’t be too pushy or you may turn people off. Make sure you’re clear about your job skills and background for your job target. You can gain public speaking skills by attending Toastmasters meetings. Networking is like making friends. It's about building relationships. Think about ways to give something back to those who have helped you. Find people in your job target. Start with friends, family members, past coworkers, and neighbors. They may know someone in your target job. 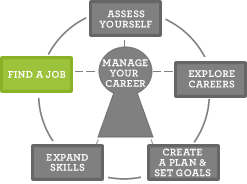 Tell them about your career goals (pdf). Send thank-you notes when people are helpful to you. Always say thank you for any information or job leads you get. This is a person who knows about the occupation you are interested in. Get feedback on your job search ideas and questions. Ask to shadow someone on the job. See if your job target has a professional group. Many members are eager to help job seekers. They may know employers with job openings. Meetup.com is a great place to find targeted networking groups! You can even start your own group. Keep your key contacts informed about your efforts in the job search. Your key contacts want to help you. How to Connect with People Online. Reaching out to more people on LinkedIn now that you have a better idea of your network.